McLaren test driver Kevin Magnussen admitted that he was hugely disappointed after he lost his place in the team for next season. McLaren decided to bring in Fernando Alonso while Jenson Button kept his place in the team. With these two, McLaren have most experienced drivers line-up in the competition, but that’s not making Magnussen feeling better. Dane had to accept that he will be test driver and that was very hard for him. He hadn’t enough time to change the team, so he say that he will miss races a lot, especially after solid debut season. “It was very frustrating. I desperately wanted to race this year and it has been tough. Immediately after learning I didn’t have the drive, it was very sad times. I was looking forward to another year and continuing the progress. I felt I had a lot more to learn, so I have been massively disappointed, but I understand the situation“, said Magnussen. “I can only say that I haven’t given up and I am fully focused to getting back to F1, I just have to make the right choice and do the right things”, added talented driver. 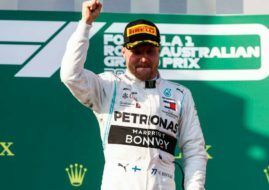 Magnussen in his rookie year turned many heads after he clinched podium at his debut race in Australia and collecting 55 points at the end of the season.